In my passion to better understand how soccer is statistically tracked I've come across what I would call is an oddity about the general characterization of "passing" in the world’s greatest sport. Here's the deal - go to Squawka.com, whoscored.com, reference the "Stats" tab on mlssoccer.com, or review Golazo information, and you'll notice they all provide passing information. My intent is not to dig deep into passing details – not yet, anyway. We’ll get there in another article to follow after I get permission from OPTA to reference their F-24 definitions within their Appendices. For now here's a simple question I have as a statistical person working on soccer analysis. What is the number of passes I should use for teams and which denominator is the right number for total passes by both teams to help determine possession percentages? In the MLS Chalkboard you can clearly see and count passes - here's an example from a game this past week. An important filter to note - the major term 'Distribution' is not to be clicked in creating this filter - all that is clicked is 'successful pass and unsuccessful pass'; note also that some details are provided on the types of passes - we’ll get there in another article. Bottom line is that the MLS Chalkboard identifies 309 successful passes and 125 unsuccessful passes for a total of 434 passes attempted. On the MLS Stat sheet - one tab over but linked here the number of passes for Chivas = 369; that number doesn't match the Chalkboard in either total, unsuccessful or successful. For Golazo, for that same game here's their total: 369 Passes total with 75% accuracy meaning the total successful passes was 277 and unsuccessful passes totaled 92. Not the same either. For Squawka.com here's their total: Successful = 270 /// headers (8), throughballs (2), passes (239), long balls (21) and supposedly crosses (0) Unsuccessful = 86 /// passes (52), headers (14), long balls (20), no unsuccessful crosses or throughballs logged here?! Yet the MLS chalkboard indicates 26 unsuccessful crosses! All told that is 356 passes; those figures don't match the other data sources. For whoscored.com here's their total: Short ball = 323, Long ball = 52, Through ball = 2, Cross = 35, for a total of 412 passes - again that figure doesn't match the other data sources. So what's the right total? Here’s a table to compare showing the source of data and the total passes submitted for statistical folks like us to leverage in our analysis. I have no idea what 'right' looks like here but here's what I've done to work through this issue. I chose one source, the MLS Chalkboard, to gather and analyze statistics on passing and possession and all other things available from that data source - where other information is not offered there I reference the MLS Stats tab and Formation tab. Why did I choose the Chalkboard? Because it provides additional detail that shows more clarity on all the other types of passes that occur in a game. For example; if you scroll down on the Chalkboard link and select Set-Pieces you’ll see that Throw-ins are included in the successful passing totals – by definition a Throw-in is a pass as it travels from one player to another. So my recommendation, if interested, is to track Major League Soccer statistics using the MLS Chalkboard first - it's harder but seems to be the best one at this time. Passing Definition: About.com World Soccer. When the player in possession kicks the ball to a teammate. Passes can be long or short but must remain within the field of play. Cross, diagonal: Usually applied in the attacking third of the field to a pass played well infield from the touch-line and diagonally forward from right to left or left to right. Cross, far-post: A pass made to the area, usually beyond the post, farthest from the point from which the ball was kicked. Cross, flank (wing): A pass made from near to a touch-line, in the attacking third of the field, to an area near to the goal. Cross, headers: 64% of all goals from crosses are scored by headers. Cross, mid-goal: A pass made to the area directly in front of the goal and some six to twelve yards from the goal-line. Pass, chip: A pass made by a stabbing action of the kicking foot to the bottom part of the ball to achieve a steep trajectory and vicious back spin on the ball. Pass, flick: A pass made by an outward rotation of the kicking foot, contact on the ball being made with the outside of the foot. Pass, half-volley: A pass made by the kicking foot making contact with the ball at the moment the ball touches the ground. Pass, push: A pass made with the inside of the kicking foot. Pass, sweve: A pass made by imparting spin to the ball, thereby causing it to swerve from either right to left or left to right. Which way the ball swerves depends on whether contact with the ball is made with the outside or the inside of the kicking foot. Pass, volley: A pass made before the ball touches the ground. Passing: When a player kicks the ball to his teammate. Through pass: A pass sent to a teammate to get him/her the ball behind his defender; used to penetrate a line of defenders. This pass has to be made with perfect pace and accuracy so it beats the defense and allows attackers to collect it before the goalkeeper. Ducksters.com offers up a Glossary and Terms for Soccer; here’s what they define a pass as being… this one is geared more towards teaching players about various types of passes they will need good skill in order to execute them. Direct Passes - The first type of soccer pass you learn is the direct pass. This is when you pass the ball directly to a teammate. A strong firm pass directly at the player's feet is best. You want to make it easy for your teammate to handle, but not take too long to get there. Passes to Open Spaces - Passing into space is an important concept in making passes in soccer. This is when you pass the ball to an area where a teammate is running. You must anticipate both the direction and speed of your teammate as well as the opponents. Good communication and practice is key to good passes into space. Wall Passes (One-Twos) - Now we are getting into more complex passing. You can think of a wall pass as bouncing a ball off of a wall to yourself. Except in this case the wall is a teammate. In wall pass you pass the ball to a teammate who immediately passes the ball back to you into open space. This helps to keep the defense off balance. This is a difficult maneuver and takes a lot of practice, but the results will make it worth the effort. Long Passes - Sometimes you will have the opportunity to get the ball up the field quickly to an open teammate. A long pass can be used. On a long pass you kick the ball differently than with other shorter passes. You use an instep kick where you kick the soccer ball with your instep or on the shoelaces. To do this you plant your non-kicking foot a few inches from the ball. Then, with your kicking leg swinging back and bending at the knee, snap your foot forward with your toe pointed down and kick the ball with the instep of your foot. Backward Pass - Sometimes you will need to pass the ball backward. This is done all the time in professional soccer. There is nothing wrong with passing the ball back in order to get your offense set up and maintain control of the ball. As noted earlier – I’m not really sure what right looks like but I remain convinced that all these organizations are well-intentioned in offering up free statistics for others to use, be it for analysis, fantasy league or simply to check it out. 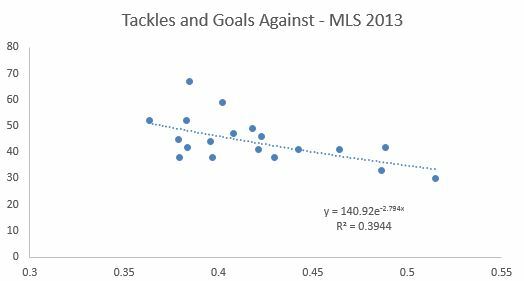 In my own effort to develop more comprehensive measurements and indicators a standardized source of data for the MLS would be beneficial – if the intent for MLS is to endorse OPTA then there remains a conflict as Golazo clearly does not use the same data filters as the Chalkboard. My vote, is and will remain, keep the Chalkboard and then, MLS, consider ways, as OPTA (Perform Group) is now, to improve it for more beneficial analysis. Here is Part II - where I peel back a wee bit more - consider these phrases, successful crosses, launches, key passes, through-balls, throw-ins and more, as ASA continues its venture into Soccer Analysis in America. Jared Young – The massive difference in pass data between sites is troubling and disturbing; I’ve been primarily using whoscored.com and golazo for my numbers so I may have to explore other options. Cris Pannullo – Major League Soccer should take an initiative and define what pass means in their league; it is surprising that they haven’t given how popular things like fantasy sports are; people eat statistics up in this country. If you have listened to our podcasts or read through our stuff, you will have heard us talk about shot ratios a lot. That's how many shots a team gets divided by how many shots its allows its opponents. A shot ratio of 1.5, for example, means that a team gets one-and-a-half times as many shots as its opponents. When soccer teams create extra opportunities for themselves, it generally leads to more goals and more points in the standings. And then there’s Montreal. The Montreal Impact has been something of a Cinderella story this season, at least statistically. Leading up to its matchup with the Chicago Fire on Saturday, the Impact had recorded the second-worst shot attempt ratio in the entire league. Montreal had earned just 61 shot attempts with 28 on target to its opponents’ 95 shot attempts with 32 on target. Yet somehow, the Impact had maintained a positive goal differential (+2) and the second-most points per match right behind FC Dallas. Against Chicago, Montreal not only won on the scoreboard two-nil, it also won the shooting and possession battles. 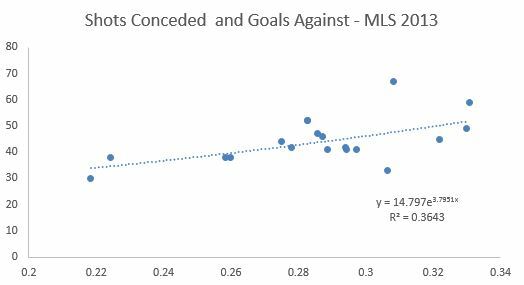 But that is a rare feat this year for the Impact, and it’s worth posing the question: Has Montreal been lucky this season, or does it do things that shot ratios and possession just can’t explain? Using just shots on goal for now, I regressed goal scoring ratios against shot ratios to see how teams “should do,” as if shots on goal were the only thing that matter. Even this early in the season, the regression was not all that bad (R2 = 0.4). It also said that Montreal’s 0.94 shot ratio should lead to about the same goal ratio. * Well that makes sense. If you generate roughly the same number of shots on target as your opponents, you should score about the same number of goals. The Impact, however, have scored nine goals to its opponents’ five—a 1.8 ratio, or +4 differential, if you prefer. An obvious thing to consider is finishing rate. Despite being outshot, the Impact players finish their attempts with goals more than twice as efficiently as opponents do. That ratio is the best in the league. My first instinct is that the Impact has been somewhat lucky, and that opponents will start to finish with more frequency. But there are two possible explanations I want to explore first before waving the cliché luck flag: the quality of opportunities for Montreal and the quality of opportunities for its opponents. Let’s take Saturday’s match against the Fire as an example of the tools I’m using. Check out the Opta chalkboard for yourself here, and you can see from where teams are shooting and scoring by clicking the appropriate boxes for team and statistic of interest. During this particular game, I have Montreal down for 16 scoring attempts, nine from outside the box, six inside, and one from right on the edge. Both its goals were scored from inside the box (though you could argue one was one the edge). Chicago, on the other hand, earned 11 attempts, ripping seven of those from outside the box, just two from inside, and two from the edge of the box. Chicago did not score. I did this for each of Montreal's seven games this season. Montreal earns more shots inside the box than outside, and that might very well be a product of its system and players, rather than just dumb luck. While the Impact is being outshot in total, perhaps that stat is skewed slightly by shot selection. Montreal's system seems to create a greater proportion of opportunities in the box. I would still expect some regression from Montreal this season back toward the middle of the standings—as its shot ratios are not favorable even after adjusting for quality—but perhaps not as far as a simple shot model would suggest. *One might note that Montreal’s attempts ratio is quite a bit worse than its shots-on-goal ratio, which isn’t even that good to begin with. It is apparently too early in the season for attempts ratios to explain much of anything with certainty, but shots models from past seasons suggests Montreal’s goal scoring ratio should probably be even worse than even-ish. That is, if shots aren't broken down by quality. We talk and we talk about the need for more information to solve some of the problems and general questions that we have as a collective community within Soccer Analytics. Today I ran across a general post about Big Data, and the revolution of really small data. It led me back to thinking about some of the discussions that Matthias (apparently he has a real name), Keith (the missing guy in the podcasts), and I have had outside of the podcasting realms. It's not always about waiting to develop thoughts or theories until you have data, but making do with what you have at your current disposal and developing theories that later--with further advances--you can prove or disprove. I'm not saying that anyone is or is not doing this... it just seemed really profound after a cup a coffee and two shots of espresso, so I thought I'd mention it.